Happy Halloween from your Naperville Family Dentist! October 31st, 2017 by Sherman Oaks Dental | Comments Off on Happy Halloween from your Naperville Family Dentist! The team at Sherman Oaks Dental would like to wish all our patients a Happy Halloween! No matter how into the holiday you are or what way you celebrate it, we hope you enjoy this fun time of year and the excitement that comes with fall. Halloween is a time of year that leads to a lot of candy and sweets being around. Of course, everyone deserves to enjoy something sweet now and again. But with so much Halloween candy sitting around, it can be hard to maintain healthy oral hygiene habits. At Sherman Oaks Dental, we like to provide our patients with educational tips on how to maintain good oral hygiene throughout the year. For Halloween, we have some ideas and tips for how you and your family can maintain healthy mouths and smiles even with all those Halloween sweets. 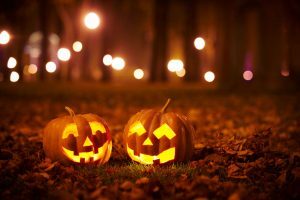 Here are Some Halloween Tips to Get You Started! Remember that timing is important: Eating Halloween candy during meals or shortly after meals can reduce the risk of harm from eating sweets. Saliva productions increases during meals which can cancel out acids produced by bacteria when eating. When snacking, stay away from sweets. Between, meals eat other snacks that won’t damage your teeth as much, such as apple slices or carrot sticks. Pay attention to the kinds of candy you eat. Certain candies, such as hard candies, stay in your mouth longer which can lead to tooth decay. By choosing different sweets, or even sugar-free candies, you can avoid these problems. Sticky candies can be harmful. Avoiding candies like taffy and gummy bears is a smart choice. These candies take longer to wash away with saliva which means they are more likely to cause tooth decay. Having a plan is also really important. Keep the amount of candy that is around to a minimum. Limit your stash and only keep family favorites around the house. Drink more water. Water that contains fluoride can lead to prevention of tooth decay. Limit sugary beverages. Drinks like soda and sports drinks that are high in sugar can greatly increase the risk of tooth decay. Maintain daily oral hygiene habits. It is important all times of the year to brush and floss daily, and this is of course true during Halloween season, too. Keep up on routine check-ups and cleanings at the dentist. At Sherman Oaks Dental, we can screen for cavities as well as keep teeth from building up plaque by performing regular cleanings. Give the team at Sherman Oaks Dental a call today to schedule your appointment. We are happy to work out a time that fits with your busy schedule. Happy Halloween, from your Naperville family dentistry!